1. Almay Makeup Eraser Sticks - I like to try different makeup and skincare products, but there is one product to which I am loyal. I swear by Almay Eye Makeup Remover Pads. They are so effective and gently and don't tear your eyelashes out. So, when I saw these makeup remover sticks, I thought they'd be great for removing eye liner on your bottom lashes. Well, I was right. They are fantastic. Best part is that the remover is built into the cotton swab, so there's no need for dipping into a separate eye makeup remover. 2. BookBub - I know I've mentioned BookBub before here on the blog, but it's worth another mention. Since I've been reading more frequently and joined the Goodreads reading challenge for 2019, BookBub has come in quite handy. Simply put, BookBub will send you a daily email with a list of books (6-8 books) at bargain prices. 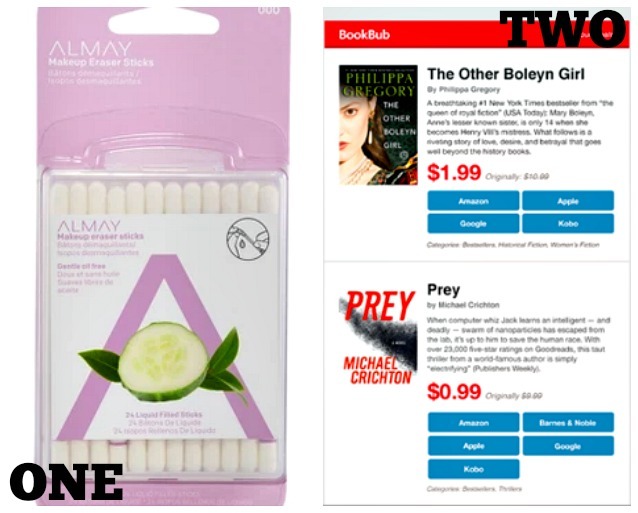 BookBub trolls popular online retailers to find the best deals on both popular and under the radar books at rock bottom prices. 3. Raisin Bran with Cranberries - When I was a child, every meal consisted of cereal. I rarely ate anything that wasn't cereal unless it was Sunday dinner at my grandmother's house. Raisin Bran was one of my staple cereals (Lucky Charms was another), but I don't think I've eaten it since then. It's not that I don't like it, it's just that, ironically, I rarely eat cereal anymore. 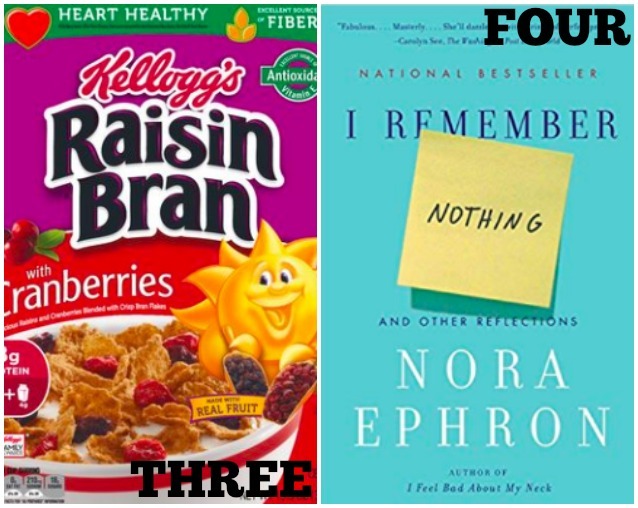 But when I saw that there's a Raisin Bran with Cranberries, I swiped the box off the shelf, rushed home from the store, and inhaled a bowl of it. In addition to raisin, it's loaded with dried cranberries (my fave!) which makes this cereal sweet and healthy! 4. I Remember by Nora Ephron - Nora Ephron is one of my favorite screenwriters, so it makes complete sense that I'd also love her as a novelist. When I found this collection of personal short stories on Amazon, I downloaded it immediatly (it didn't hurt that it was only $2.99). One of the things I love about Ephron is her incredibly relatable insight into life as a woman in her midlife. Her observations ring true, and there are times when I feel like I had written some of the stories. I keep this book on my nightstand and turn to it when I need to good laugh or feel good story that perfectly aligns with life as a woman in modern times. 5. Drunk Elephant Beste No. 9 Jelly Cleanser - After receiving a sample of this amazing cleanser from Sephora, I was hooked. I prefer gel cleansers, and this one lathers nicely and doesn't leave my face feeling dry or filmy afterwards. It is a bit pricey ($32), but since I use only a dime-size amount each time, it lasts a long time. 6. Thrive Market Organic Sriracha Cashews - I love flavored nuts, especially cashews. 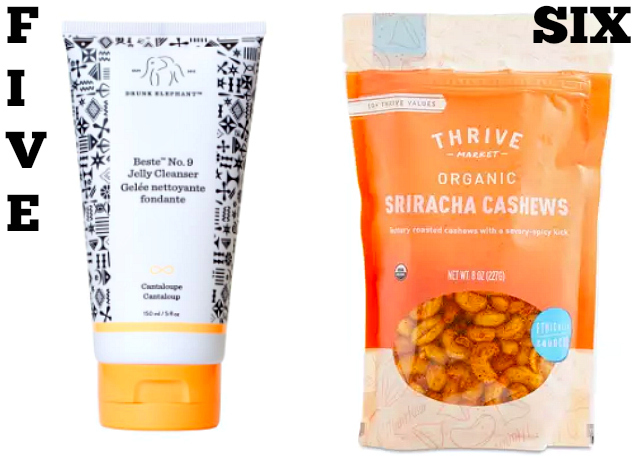 I've been using Thrive Market to order grab-and-go snacks that I can throw into my gym bag so I can grab a handful either before or after my workouts. I love spicy foods, so it's no surprise that these cashews have quickly become a favorite, not only for pre- and post-workouts but anytime of the day.